The Child Care WordPress theme helps you quickly and easily build a professional and informative website for your daycare center, day camp or after-school program, even if you've never built a website before. 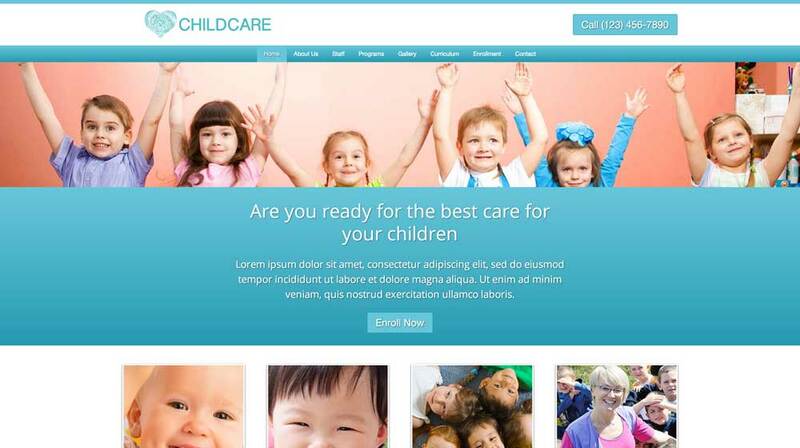 This extremely versatile Child Care WordPress theme is an ideal website template for daycare centers, nursery schools, day camps, after-school programs or any type of business that offers child care services. We've designed this premium WordPress theme with a bright, playful design and pages already set up for you to describe your approach to early childhood education, age-specific activities, enrollment procedures, and much more. Just replace the demo text and placeholder images with your own to use this website template as-is, or choose a custom color palette and give your site a personalized look and feel. You'll be amazed by how much you can customize your new website without any coding at all using our unique front-end editing tool and drag and drop widgets. 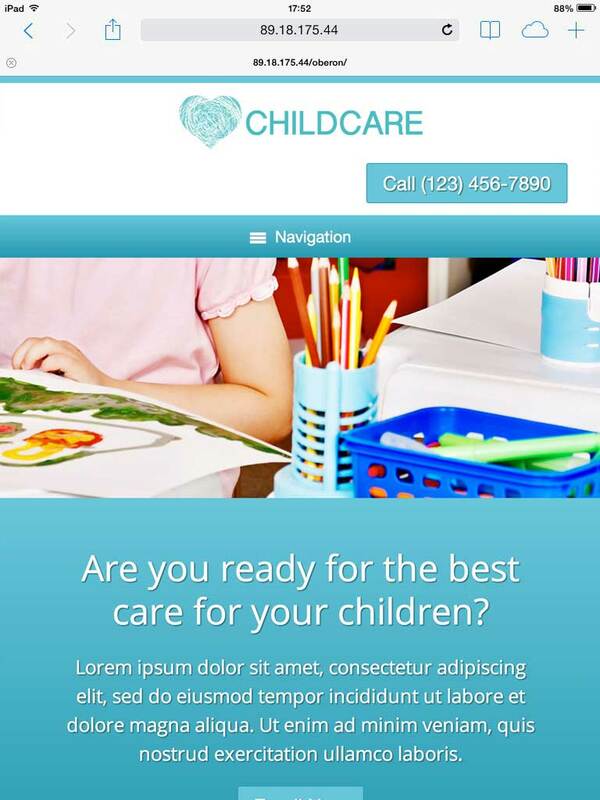 With built-in social media integration, a helpful SEO manager and sleek, mobile-optimized design, the Child Care WordPress theme helps you get the most out of your website by creating an informative and professional online presence for your daycare center. 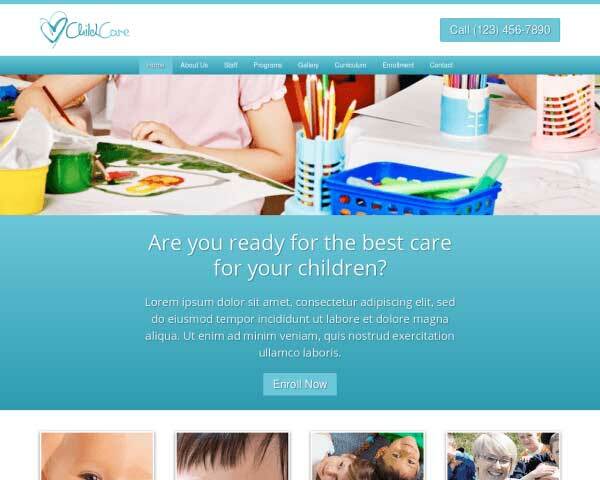 The Child Care WordPress Theme is built with the business needs of child care experts in mind. Everything you need is included to help you get your website online fast. 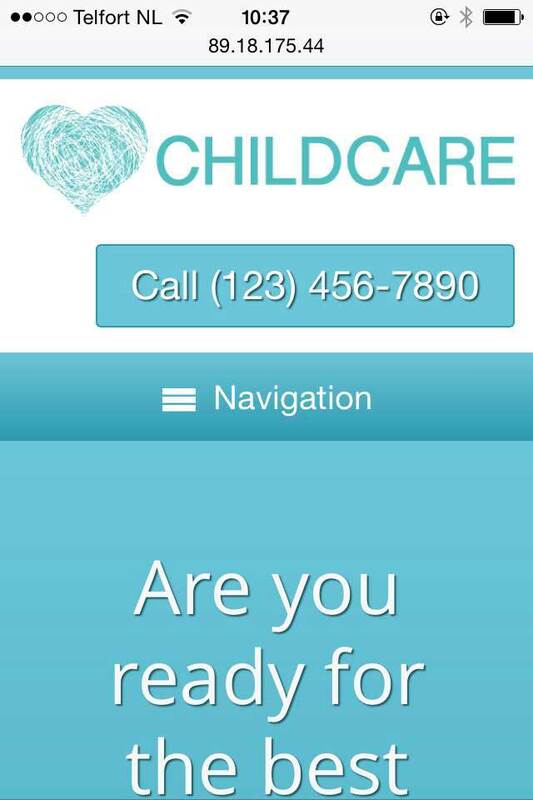 The contact page on the Child Care WordPress Theme encourages visitors to get in touch. List your contact details together with a Google map, route planner and customizable contact form. 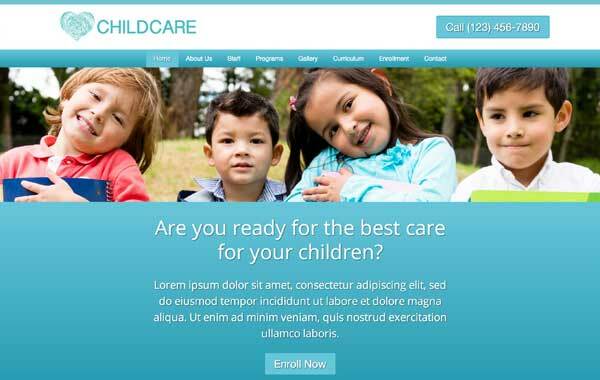 The Child Care WordPress Theme theme features an accessible, easy-to-navigate design that gets visitors excited about your unique services. Offer answers to the most frequently asked questions on the Child Care WordPress Theme's FAQ page. It's filled with placeholder text and ready for your own content. 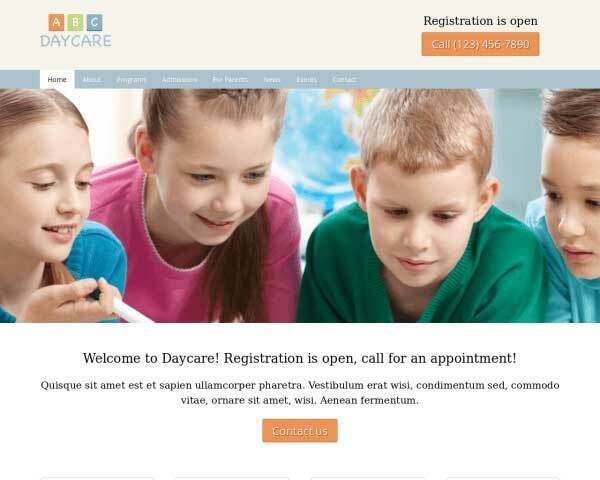 This premium WordPress theme for childcare centres allows you to link buttons or images to PDF pages that visitors can simply click to download and print forms. The Child Care WordPress Theme includes built-in charts so you can neatly display daily schedules on your program pages. Simply replace the demo text and times on the schedule. Offer an attractive overview of your services on the homepage of the Child Care WordPress Theme, along with quick navigation to important pages on your website. Clients will be curious to learn about your team of child care experts before trusting you. Introduce your staff with a photo and short bio on the about page of the Child Care WordPress Theme. When you build your daycare website with the responsive Child Care WordPress theme, you can be sure that visitors who access your pages via smartphones and tablets will be treated to the same professional look and user-friendly functionality of the desktop version. Our solid, mobile-optimized design will automatically adjust the layout of your text and images to display beautifully on any screen size, even as you add new content over time. Visitors using mobile devices are able to simply tap on your phone number to dial, a thoughtful convenience for busy parents on the go.